The Seattle Seahawks and their head coach Pete Carroll are all about competition, with rookies viewed as competition enhancement to bring out the best of their roster. They look to draft and develop good, young athletes because they feel they can reach players with different learning styles. They are willing to overlook performance or character shortcomings at the college level if they see something they like in a young players film and he offers an athletic profile and playing style they covet. They count on their veteran locker room to bring along and mentor talented young players. Carroll will be heavily involved in selecting players that he feels they can reach using the aforementioned philosophy. They intentionally targeted a pass-rushing 3-technique defensive tackle in last year’s draft and then were forced to trade for Sheldon Richardson from the New York Jets after rookie Malik McDowell suffered a non-football injury that kept him out for the season. 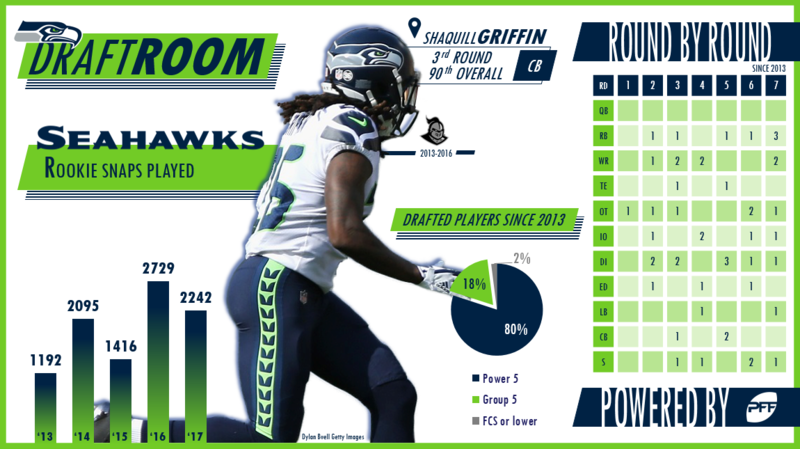 After several seasons with incredible play from their secondary, Seattle will be in the market for some new coverage players, especially with the release of top cornerback Richard Sherman. Defenders who make plays on the ball will be a large priority. They intentionally scout for defensive backs with the athleticism and foot quickness to play in the slot in college, as they believe these players will likely be able to play on the outside (and they’ve already shown can play in the slot). Versatility on the offensive line is a priority for them – as evidenced by their selection last year of Ethan Pocic from LSU – but during the last few years their picks along the front-five have been among their least-valuable players in terms of Wins Above Replacement (WAR – roughly the number of wins a team gets from replacing an off-the-street player with the player of interest). They have been, and likely will be, proactive in trading and trying to acquire more picks or veteran players (they had 11 selections in 2017 and have used their first-round pick to trade for players like Percy Harvin, Jimmy Graham). If Seattle uses this year’s 18th pick, it will be just the second time since 2013 that they’ve picked in the first round. However, lacking a second-round (Richardson) or third-round (Duane Brown) pick and depth along the roster means trading down might be even more likely this April. The Seahawks trade of Michael Bennett and a seventh-round pick to the Eagles netted them wide receiver Marcus Johnson and a fifth-round pick, giving them four selections in that round. How Have the Seahawks’ Draft Classes Stacked Up League Wide 2013-2017? PFF grade above 74.0 each of his three seasons. Has added value as a receiver and return man. 22 sacks, 15 quarterback hits and 84 quarterback hurries the last two seasons. Played 876 snaps as a rookie and earned a 77.2 PFF grade. Played 599 snaps for the 2013 Super Bowl Champion Seahawks team and graded well as a run-blocker. Injury-riddled for much of his time in Seattle, but his 72.4 PFF grade in 2017 earned him a free-agent deal with Washington. Was a head-scratching pick at the time. He’s earned a PFF grade of only 34.2 and 48.6 his first two years. PFF grade of just 35.7 his rookie year, earning the worst pass-blocking efficiency among guards in the process. Thrust into a starting role at left tackle because of an injury to George Fant, Odhiambo lasted just 484 snaps in 2017 before the Seahawks were forced to replace him with Brown via trade.